It’s still early in the season and the weather patterns have been erratic enough that we still don’t have a real sense of the season’s owl migration, but we’ve had decent results so far. 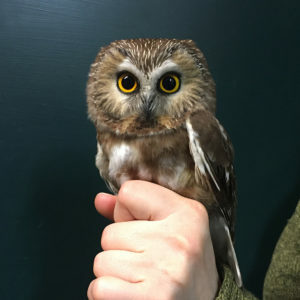 March was pretty good for Northern Saw-whet Owls (NSWO). In previous years March has produced extremely varying results in regard to NSWO. We banded over 350 one year, and as few as 2 in another. This March we banded 73 NSWO, so it was far from the best, but much better than the worst. As was the case in March, April has started off with a mix of unsettled weather patterns and productive nights. We’ve banded 37 NSWO so far this month, bringing the season total to 110 new NSWO, along with 10 that were previously banded. 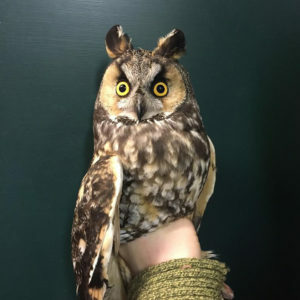 Aside from the NSWO, the first few Long-eared Owls (LEOW) have arrived. The first LEOW was banded on March 24, which is on the early side here, and three more have been banded since. It looks like we have more sloppy weather on the way, but hopefully the breaks in the weather continue to be relatively productive. The first Long-eared Owl of the season. A NSWO we originally banded as a juvenile in July, 2017. 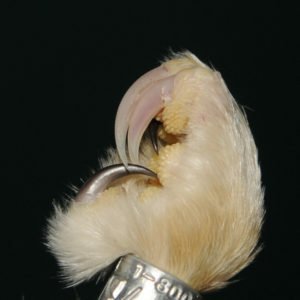 A NSWO with two white talons.